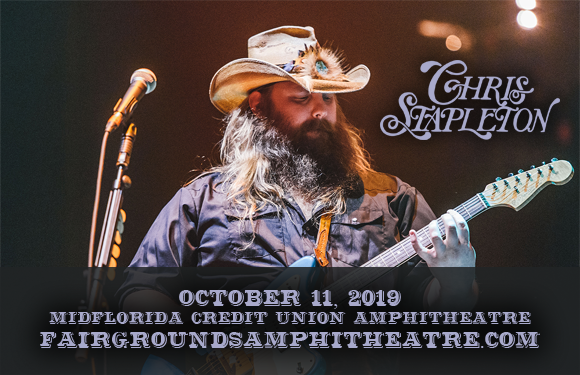 Chris Stapleton comes to MidFlorida Credit Union Amphitheatre on Friday 11th October 2019 on the All-American Roadshow Tour! The Grammy-winning country star has been getting his show on the road annually since 2017, and this year promises to be bigger and better than ever as he performs tracks from Traveller, From A Room: Volume 1 and From A Room: Volume 2! Joining him will be hit songwriter Kendell Marvel in support! American singer-songwriter, guitarist, and record producer Chris Stapleton began his music career as a sought-after songwriter, penning hits for a variety of high-profile artists, including Adele, Brad Paisley, Dierks Bentley, Vince Gill, Peter Frampton, and Sheryl Crow, and he has co-written six number-one country songs for other performers, including Kenny Chesney's five-week number-one "Never Wanted Nothing More", George Strait's "Love's Gonna Make It Alright", and Luke Bryan's "Drink a Beer". In 2015, Stapleton became the first artist to ever to win Album of the Year, Male Vocalist of the Year and New Artist of the Year at the Country Music Association Awards for his debut solo album Traveller, which also went on to win two Grammy Awards the following year. His next project was a double album, released in two instalments in 2017 – From A Room: Volumes 1 & 2 – which brought him even more critical and commercial success. To date, Stapleton has won five Grammy Awards, seven Academy of Country Music (ACM) Awards, and ten Country Music Association (CMA) Awards as a solo artist.